To provide you with our full support, we assist you with our 24/7 customer service, email chat support and any other modes of communication required to make your project a smooth sail. Our experts can set up your Volusion Platform in a professional and effective way, so as to generate a huge number of customers and increase your revenue. Our team of professionals will help you with Volusion Data Entry by arranging and rearranging your product data methodically to give your customers a state-of-the-art online shopping experience. We can precisely enter product data such as title, description, SKU, UPC, prices, discounted price (If applicable), images, quantity, product URL into your Volusion backend system. Our specialists can add significant product attributes like colour, shape, size, weight, dimension etc. This way customers can be fully aware about the product’s specifications. 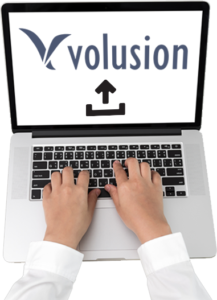 Our talented Volusion Product Management experts can handle bulk product upload efficiently in a timely manner. We can use bulk listing softwares like Turbo Lister, Auctiva, InkFrog and CSV files to accelerate bulk product uploading. We categorize and subcategorize your products to give your customers a clear view. This way they can reach out to your products without any extra efforts. Our Content Writers have the ability to churn out the most eye catchy and unique product descriptions to keep your customers well-informed. Additionally, we create SEO oriented product meta titles and meta tags to increase your store page rankings on search engines. We also add HD images and graphics to rev up the visual appearance of your store page. Our skilled Image Editors can modify raw images by removing blemishes, enhancing, cropping, resizing and if need be, even creating suitable images. We can add and update massive amounts of product information through CSV files. Our expert Volusion Data Entry team makes perfect use of Volusion Product Import and export tools to transport humongous amounts of data in an efficient manner. Our aware and meticulous team is vigilant about the ever changing pricing dynamics. Thereby they keep a constant check to review prices in real time. We also perform a price comparison for your products. We can consistently monitor your competitor’s websites to see what prices they offering. This way you can offer the prices to your customers. Consistent inventory management is imperative for the success of your Volusion Store. Therefore, we will regularly check on the product’s availability and make sure that out-of-stock products are listed as out-of-stock. We make sure that your customers receive their desired products on time by assisting you with order processing and order tracking.